Wampex is an important networking event in the region. Economic powerhouse India has been named 'Partner Nation' for the 20th West African Mining & Power Exhibition (WAMPEX).The biennial event benefits from broad regional government support and comprehensive industry participation. 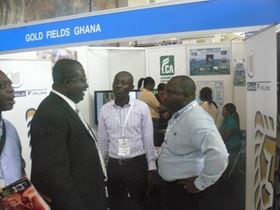 WAMPEX will take place between 28 to 30 May at the Accra International Conference Centre in Ghana's capital. “WAMPEX is a highly versatile networking platform enabling all stakeholders and decision makers in the mining and power sectors across West Africa's ECOWAS countries to explore business and growth opportunities,” said John Thomson of Exhibition Management Services, organisers of the event. Over 100 companies in the mining and power sector will showcase their products and services at WAMPEX, from industry-specific equipment, technology and services to consumables. “India is extremely proud to be the partner country for WAMPEX 2014”, said Victor Monteiro, marketing manager of the Confederation of Indian Industry (CII). The CII is a non-government, not-for-profit, industry-led and managed business association, and has over 7,100 private and public sector members. “The WAMPEX partnership meshes very well with India’s strategic growth and development plan,” added Mr Monteiro. “The Indian metals and mining industry is expected to more than double - from US$141.9bn in 2011 to US$ 305.5 billion in 2015. “A high-level delegation representing large Indian companies will be participating at WAMPEX, exploring investment and supply opportunities to related industries in West Africa,” he said. These companies include Elektrolites Power; Keromiyons Intech; Robot Components; Forech India; Kishore Vadilal; Involute Tooling Corp; New India Electricals and NIE Power & Engineering. A focus for India is iron ore, since West Africa has significant high-grade deposits of the mineral, and the region boasts low entry barriers and significant future revenue potential. Voith has won a €40 million contract to modernize part of the 360 MW pumped-storage Ffestiniog power station for Engie in North Wales.